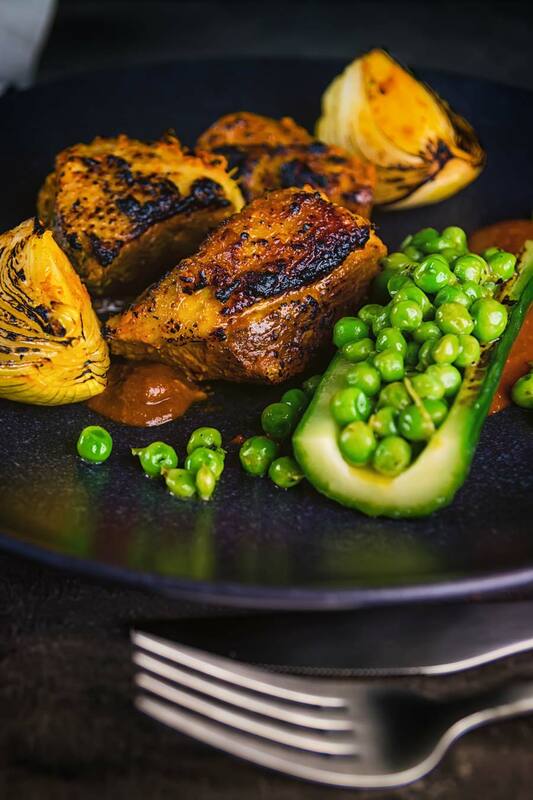 This Indian duck curry is inspired by tikka Masala and features beautifully grilled marinaded duck breast with a tamarind and honey sauce, cucumber and peas! 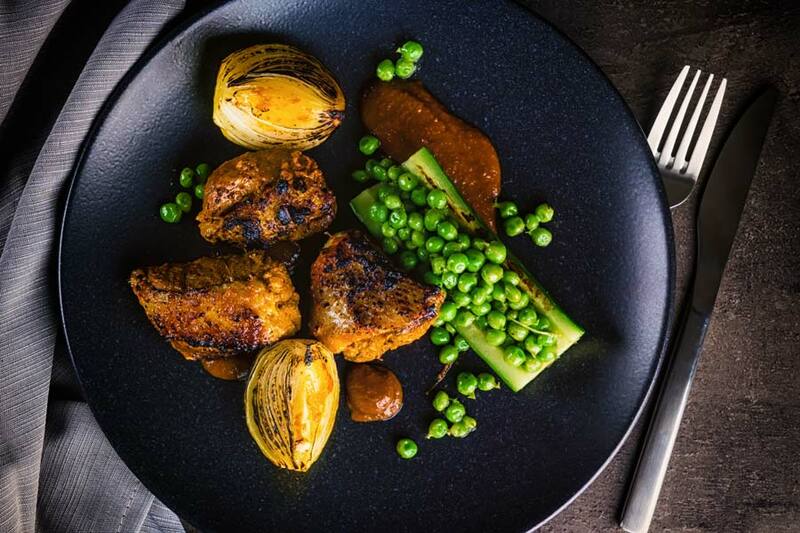 Indian Duck Curry With Seared Cucumber and Peas. You know I like a good fakeaway right? Well, this Indian Duck curry is a dish I had been working on for a while. It is actually the recipe I developed for our Valentines Day meal this year. I’m very happy to share it with you as it means it is a good excuse to cook it again. In many ways, it is inspired by chicken tikka masala, a recipe that I consider as British as it gets! It is rumoured to have come from an Indian Restaurant in Glasgow when a ‘drunk’ punter came in and ordered a Chicken Tikka. Then promptly complained when it had no sauce. The waiter returned to the kitchen and made a sauce involving a tin of cream of tomato soup and some spices. So what we have here is my Duck Tikka Masala and it is awesome. The meat is juicy and still rosy pink and flavoured by a marinade. We then take the marinade and turn it into a sweet and sour curry sauce powered by tamarind and honey. Duck may seem to be a relatively unusual ingredient to have in a curry. But it really works exceptionally well, the strong, rich and bold flavours of duck work really well with strong flavours. It is a combination I have used before in my Thai Duck Curry. The gravy or sauce in my latest duck curry is very much a sweet and sour affair. A Flavour combination that is usually associated with South East Asia is actually pretty common in Indian food too. Most notable in the glorious chicken pathia curry. The accompaniment for this Indian Duck Curry recipe is a bit of fun I have been playing around for a while. 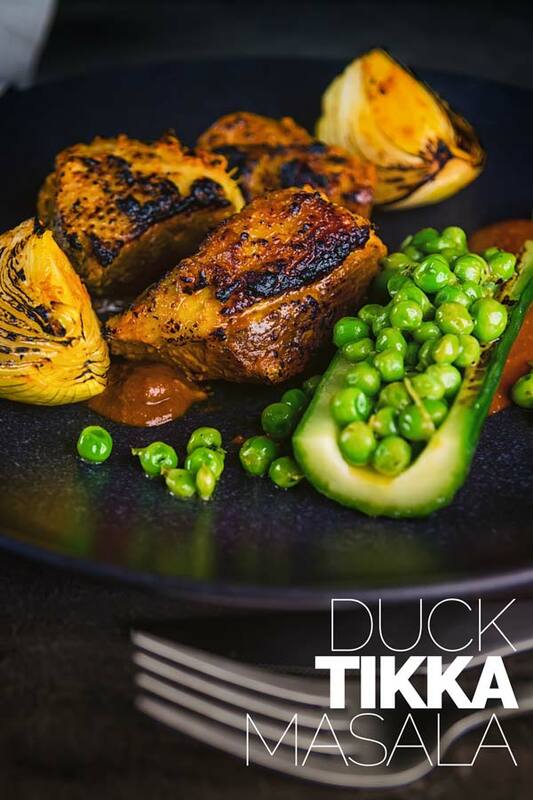 The minty sweet peas and cucumber are perfect alongside the rich duck tikka and sweet and sour sauce. It is lighter and less filling than rice and bread which is where my usual Indian side dishes go. But also relatively light in spices, so that the flavours compliment rather than fight the flavours in the masala sauce. I suppose it is another hint to the British origins of this recipe. It also doffs a cap to the classic flavours you expect from a North Indian cucumber salad. Having said that peas are actually a relatively common ingredient in Indian food, probably most famously in Keema Matar. Tamarind is a seed pod from a tropical tree and is often used in African, Indian and Asian foods. It is sour in flavour but also has a sweet earthiness and makes for the most wonderful sour addition to recipes. It is often sold in jars but most commonly is sold in what looks like a big brown sticky block. This is the very best stuff to buy as far as I am concerned! To turn this sticky block into tamarind pulp take a lump and soak it in the same weight of boiling water. Let it sit for 15-20 minutes breaking up occasionally with a fork. Then strain it through a sieve. Yes it is messy, yes it is sticky, but it is gloriously wonderful and has no substitute! Cut each duck breast into thirds and rub with the turmeric, lemon juice and salt. Now take the onion, garlic and ginger and add to a mini blender and mix to a paste. 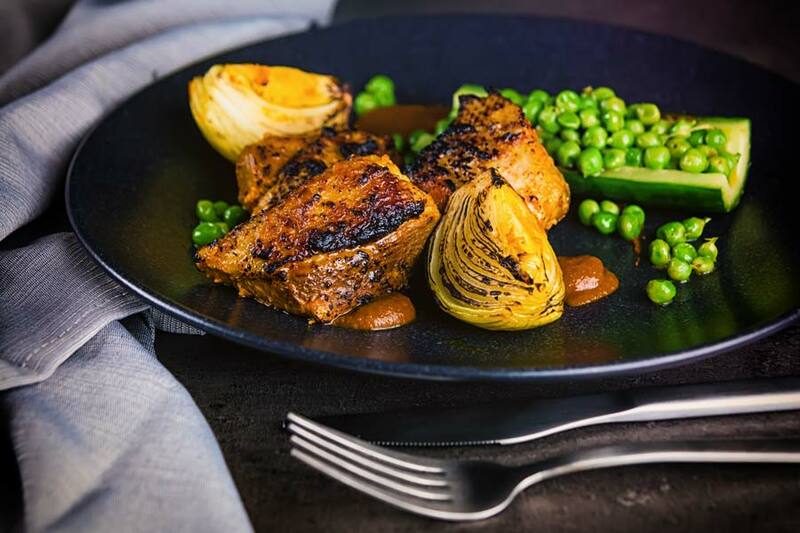 Take the onion paste and mix in the tomato puree, chili flakes, cumin, coriander, garam masala pepper, yoghurt and cooking oil to form your marinade and pour over the duck breast and allow to marinade for at least 4 hours, or even better over night. Heat your grill or broiler if you are that way inclined to high. 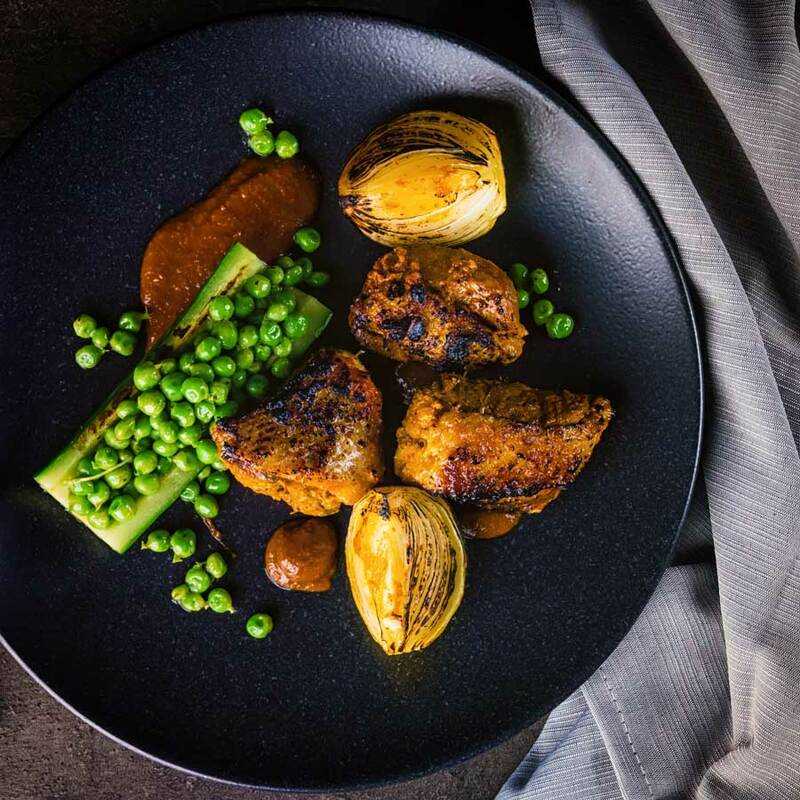 Whilst the grill is heating remove the duck from the marinade and thread onto skewers along with the onion and place the remaining marinade into a small saucepan over a medium heat. Add the tamarind pulp and honey to the marinade and stir check for seasoning and reduce the temperature to low and allow to simmer. Place the duck and onion skewers under the grill and cook for 3-4 minutes a side checking constantly to ensure you are getting a nice colour but not burning them, when cooked allow to rest for a couple of minutes. Now heat a dry frying pan over a high heat and scorch the cut side of the cucumber for 60 seconds, then remove the cucumber. Remove the pan from the heat add the asafoetida followed by the ghee and when melted add the peas and mint sauce, return to a medium to low heat and add back in the cucumber to warm through. Then serve on warmed plates. This would be awesome served with a chapati or roti, but I serve mine with naan bread, why? Because I am from Birmingham and it is naan with everything! Love the idea of serving this with minted peas. They’ll be a great refreshing side dish to combat the spices! First..I LOVE duck…so that is a winner. Second I have never seared cucumbers….or cooked them any way for that matter. Very interesting indeed. Love the flavours going on here. 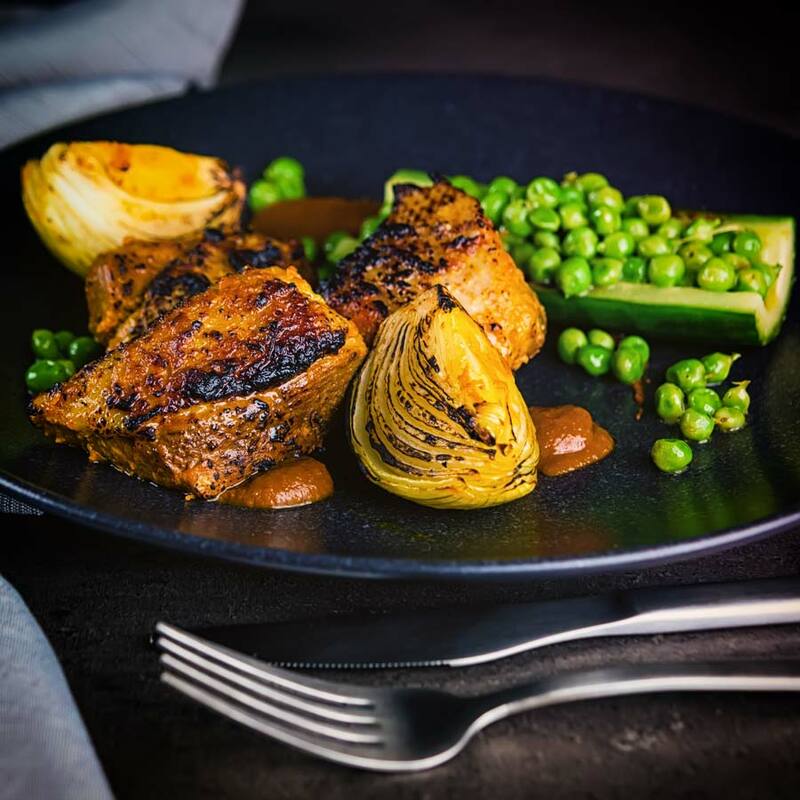 Thanks Gloria, I love playing around with new ideas, the slight bitter ness from the char here works so well with the sweet minty peas and the flavour and cooling of cucumber is really classical in Indian food. I’ve never made anything like this, but those flavors sound really inviting — plus it’s healthy-ish! I’m currently on a no carb (sob) diet, so this is exactly what my belly needs now! haha fakeaway, love it! Great combo with the duck. we looooove duck! so fatty and flavorful, in the best possible way! I have never had Seared Cucumber before but it sounds super good. I am going to try making it this way this weekend. This recipe is far from my comfort zone, and I love that! i’ve been wanting to add some new flavors, ingredients and techniques in the kitchen and this will be the perfect start!